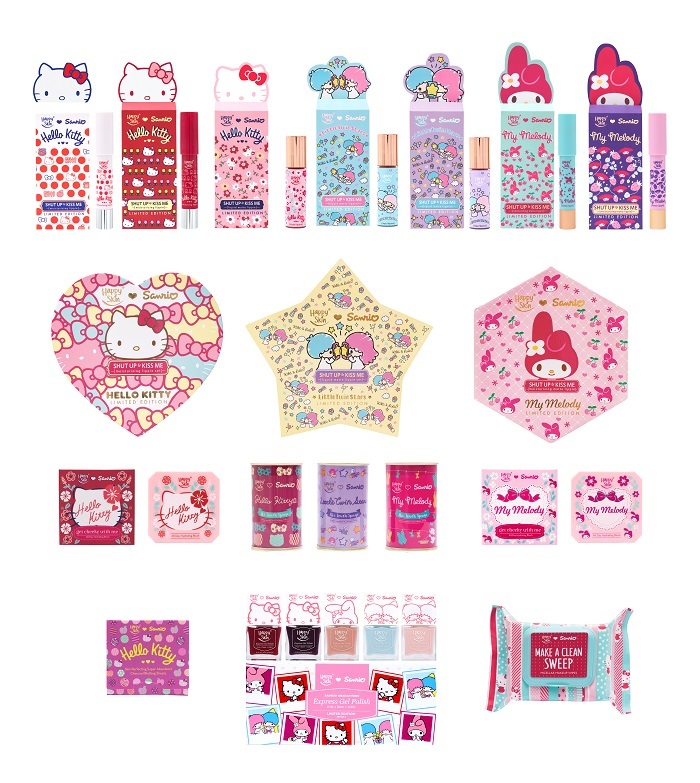 ...goes to Happy Skin ♥ Sanrio Characters! It's already been two days since its launch and I'm still over the moon seeing this collection first hand with my girl friends. Call it silly but as 80s and 90s kids, we all lived through collection after collection of Sanrio characters. Did you know that Hello Kitty has a twin sister named Hello Mimmy? Sophie is my Hello Mimmy sans the yellow bow. The Happy Skin team put together three stations to match My Melody, Hello Kitty, and the Little Twin Stars' personality. I thought My Melody was the cutest showcasing their newest product, Happy Skin ♥ Sanrio Characters Make A Clean Sweep Micellar Makeup Wipes (Php 249) and more. SO. MUCH. CUTENESS. I can feel my cheeks actually flushing because I'm super kilig to share these photos with you! Given this collection also has seven (!!!) new lippies, here's some swatch love for all of you! If you love both Hello Kitty and the Skin Perfecting Super Absorbent Charcoal Blotting Sheets (Php 175), you will love the new packaging from this collection. It's the same awesome product packed in a super cute pink paper casing. Featured in the photo above is also my favourite product from this collection -- the new Happy Skin ♥ Sanrio Characters Make A Clean Sweep Micellar Makeup Wipes (Php 249). If you love MAC's wipes, you will love this even more. Each pack has 25 super smooth and durable wipes that can take every single trace of makeup. No need for a second sheet to wipe off heavy makeup including super matte liquid lipsticks and waterproof mascaras -- tried, tested, and proven by yours truly. Apart from the super cute Happy Skin ♥ Sanrio Characters Air Touch Sponge in Hello Kitty (punchy red) and My Melody (fun pink), how cute are these Happy Skin ♥ Sanrio Characters Air Touch Sponge Duo in Little Twin Stars (Php 499)? Each pack has two mini makeup blending sponges that can be used for the cheeks and under eye area. They come in two super pretty colours: purple and blue to remind you of Lala and Kiki.